Every year five million tonnes of waste wood is generated in the UK and year on year we have seen a rise in how much of that is recycled or reprocessed due to increases in landfill taxes and a Government drive to recycle more. Uses for recycled waste wood include traditional feedstock for the panel board industry, which still accounts for the majority of recycled wood, as well as animal beddings, equestrian and landscaping surfaces, play areas and filter beds. 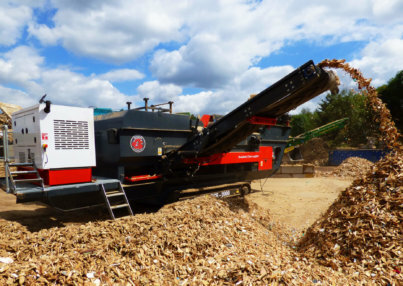 However, more recently there has been a huge growth in the reprocessing of waste wood into biomass fuel, both at home and with exports to Europe, changing the face of wood recycling as we know it. Recycled wood has long provided an ideal ground covering for gardens, pathways and agricultural land, to suppress weeds. But as well as being used for mulches, recycled wood is also used for other land and horticultural products because its qualities mean it is durable and hard-wearing against compaction, while safe for people and animals to use. Other products include equestrian arena surfaces and horse gallops, play area surfaces in children’s playgrounds, and surfaces for golf pathways. Local authorities are also increasingly using coloured wood chip to visually enhance public gardens, parks and highway roundabouts and to clearly mark out pathways for people to follow. Like other products made from recycled wood, landscaping and horticultural surfaces go through a stringent cleaning and production process to ensure they are free of any contaminants and are chipped to the correct size and texture for their purpose. Animal bedding made from clean recycled wood fibre has become a popular product among farmers and animal lovers across the UK. First launched just over 15 years ago, recycled wood fibre beddings are now regularly used for horses, cattle and commercial and domestic poultry, as well as pets such as guinea pigs, rabbits and even tortoises. They are also popular with breeders of pigeons, canaries and budgies. There are a range of beddings on the market which prove popular for many reasons. The raw material is put through stringent cleaning processes, including dust extraction, to produce the various types of bedding suitable for the particular end market. Recycled wood fibre bedding provides a warm, absorbent bed which is easy to use and economical. Some beddings are also treated with additives, giving them extra benefits such as antibacterial or bio-secure properties. Panel board was the first main off-take for recycled wood fibre in the UK and remains a major customer for today’s wood recyclers. The industry accounts for around 850,000 tonnes of recycled wood year. Panel board products are categorised as sheet materials in which wood is the dominant material in the form of strips, veneers, chips or fibres. They include plywood, particleboard (including chipboard), oriented strand board (OSB) and fibre boards including medium density fibre board (MDF). Panel board mills manufacture these products from a mixture of virgin and recycled wood. The mix varies depending on the end products required, but the benefit of using recycled wood within the mix is that it is much drier than virgin wood. The UK consumes more than five million cubic metres of panel board a year. WRA members supply around 1.5 million tonnes of processed waste wood to UK biomass facilities every year. In 2017-18 we are expecting the UK biomass market to double, with an additional 1.6 million tonnes on new waste wood power plant capacity currently under construction and expected to come on stream. Suffice to say the waste wood sector is making a significant contribution to UK energy security, with the total 3.1 million tonnes going into UK energy supply representing 3,500 GWh of annual domestic power production – that’s enough to supply one million UK households!